Bluetooth 3.0, A2DP, HFP, etc. The SMH10R has a very low profile. Something I definitely can appreciate. It's practically invisible! That's really the main benefit of this unit over the SMH10. Otherwise, it's a very similar unit in terms of functionality. If you're not familiar with Sena, they're a Korean company that's been competing very well in the bluetooth communicator market. I've enjoyed my SMH5 but now it's time for an upgrade! This unit is very different in that it has a flat interface with 3 buttons, no more jog dial / button combo. That feature is really convenient, but I actually don't miss it as much as I thought I would. Surprisingly I don't mind the smaller buttons. One thing about the jog dials is that it's a bit sensitive and if you hit it the wrong way you'll pause your music by accident. Or if you try to increase the volume, you might accidentally bump the button. Feeling the buttons isn't so bad. I placed my unit strategically so when I put my hand up my pointer finger immediately touches the middle button every time. Then I know my third finger will touch the + button as well. It looks a lot bigger up close. But take a look at this shot of my bike with the battery on my other Shoei. Not too bad. My husband and I have ridden together only once since I picked up this unit but it worked quite well for us. Pairing was really easy and immediate. As soon as you go into intercom pairing mode on both helmets, they connect automatically. It just takes ~10-20 seconds for the helmets to find each other. No need for pressing any buttons to connect, either. You just wait for them to do their thing. Sound quality was good at higher speeds, much better than the SMH5. He's still getting used to the flat buttons as he complained it was difficult to find the controls. But I think it's something to get used to and the higher sound quality certainly makes up for it. I imagine that it'll definitely be harder to find the buttons with thicker gloves, But the protruding ridges between the buttons feel just thick enough for me to feel them through my (uninsulated) race gloves. Intercom distance is supposed to be ~0.7 miles in open terrain. Unfortunately we didn't get to test that distance but we were certainly good for 0.25-0.5 miles; another improvement from the SMH5. I will try to test the distance on our next ride and report back! Something new that I found neat is that while I was intercomming (is that a word?) with my husband, I also had Google Maps giving me directions in the background. As he and were chatting, I would hear the directions come in at the same time! On the SMH5, I would have to tap back over to my phone to hear that. Now I don't have to! Super handy. Music was definitely interrupted however, so I could talk to him. On the same day, I also paired with a friend who has the SMH10. Funny thing was when my husband and I were chatting, my friend could intercom right into our convo creating an immediate 3 way call. I only used up half the battery that day, and have continued to use it on my short commutes to work. I would say the life on the unit is a hell of a lot longer and true to the 8 hour music time. I can tell you that the main unit holds up to rain quite well. Sena doesn't say that the unit is waterproof, only water resistant. Fortunately for me, the unit itself was very waterproof. I rode in the pouring rain for 3.5 hours (150 miles) on the freeway. After an hour or so, the unit gave up and wouldn't stay on. Turns out the battery had just died. Phew. Once I got home I swapped in a new battery and it was fine. The battery is actually removable, it has a mount that is permanently attached to the helmet and then you slide the battery into it. For me, the real downside to this unit is the fact that you can't clamp the unit onto the helmet like other models. So you must permanently attach the battery mount to the back of the helmet via 3M stick tape (included in the box). You can still unplug and remove the battery, however (as I had to when I replaced it). And you can also use the velcro pad to attach the main unit to the helmet so at least you can remove the unit if necessary to another helmet (which I'll be doing shortly :D). 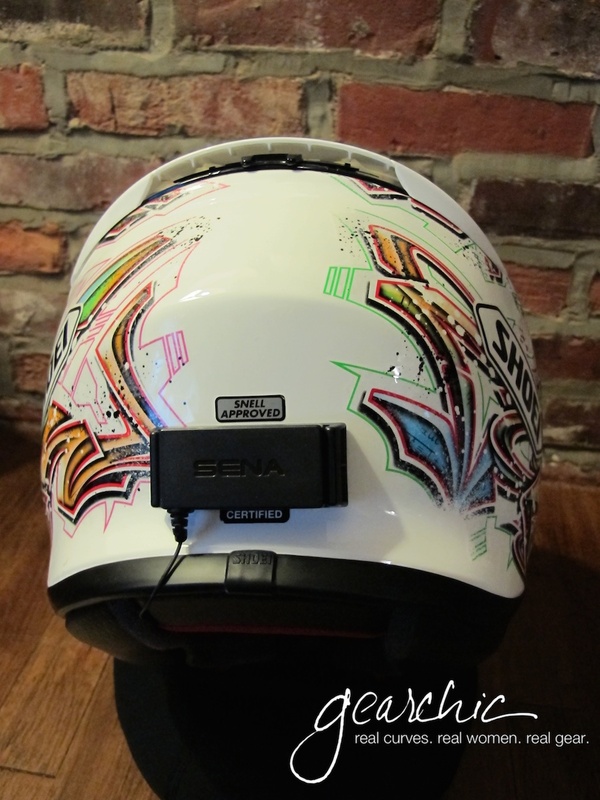 You will have to buy the Sena SMH10R Battery Kit to attach to each additional helmet. The kit comes with another battery mount (that the battery slides into) as well. If you are going from an SMH5, it's a no brainer. But for me, I have a high priority on low profile vs. jogdial. I don't care about the dial anymore, I simply want a flatter, low profile mount. The larger coms definitely add a bit of extra wind noise and I think the button might be vulnerable to damage if it hits something whether the helmet falls on the ground or just crashing on that side of the helmet. I get all the features I want and need from this unit. The only thing I would want is some way to make the buttons stand out a bit more, but I know that would probably increase the size overall. To keep the unit as slim as possible, I know I'm losing out on larger buttons that are easier to feel. Don't forget to read your manual, as there are crucial instructions on pairing, using different bluetooth units, VOX commands and more. As I was googling to figure out quick how to's, I didn't see anything that was helpful so here's my quick how-to guide for the SMH10R. There's only 3 buttons (+, - and Sena/middle), so not much to it. Call Siri (iPhones): Press and hold Sena button until you hear the single beep. First you'll hear two beeps, just keep pressing and then you'll hear another soft one. Let go and Siri should speak to you. Music won't play out to the headset: Disconnect the headset from your phone's bluetooth profiles (or forget device, whatever works on your phone), make sure you use Phone Pairing Mode and then repair. This is what worked for me on both this headset and the newer 10R.